Essendon attracted a crowd of 97, 000 people . The Bombers are playing well , assuaging rumours of drug taking , and easing beseiged Bombers coach James Hird 's worries .In a game of fast paced action and spectacular aerial feats , the two combatants were very closely matched in all contests. Essendon won this time around , and Bomber Zakaharis won theAnzac Day medal for best on the ground . Across the Tasman another game of AFL football was being played , honouring the great Australian , New Zealand , Anzac Day connection . 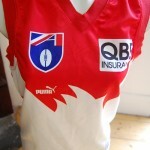 In an historical first AFL game overseas , played for points , as part of the AFL fixture , the Saints played the Swans . 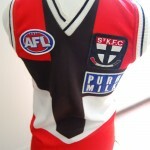 St Kilda , wearing a maori inspired design football jumper , jersey , guernsey played well against Sydney , who were just too strong at the finish and overpowered the young Saints side . Swan Dan Hannebery won the Anzac Day medal in this inaugral NZ Game . Fans on both sides of the Tasman were wearing their football jumpers , jerseys, guernseys , to support their teams. 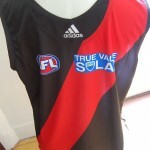 This entry was posted on Friday, April 26th, 2013 at 10:28 am	and is filed under AFL, football jumpers, NRL. You can follow any responses to this entry through the RSS 2.0 feed. Both comments and pings are currently closed.